Conservative Rasterization means that all pixels that are at least partially covered by a rendered primitive are rasterized, which means that the pixel shader is invoked. Normal behavior is sampling, which is not used if Conservative Rasterization is enabled. Conservative Rasterization is useful in a number of situations, including for certainty in collision detection, occlusion culling, and tiled rendering. 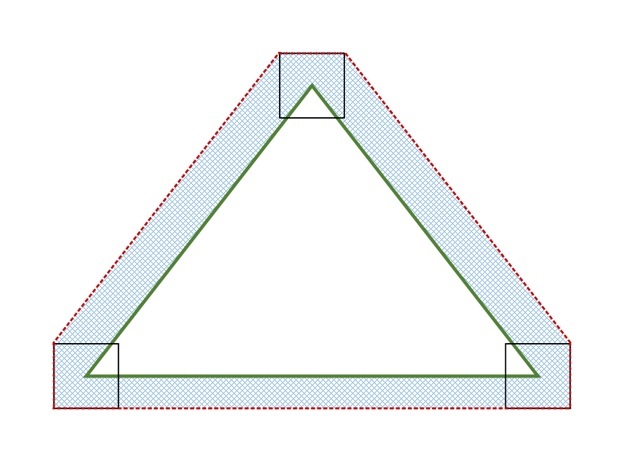 For example, the following figure shows a green triangle rendered using Conservative Rasterization, as it would appear in the rasterizer (that is, using 16.8 fixed point vertex coordinates). The brown area is known as an "uncertainty region" - a conceptual region that represents the extended bounds of the triangle, required to ensure the primitive in the rasterizer is conservative with respect to the original floating point vertex coordinates. The red squares at each vertex shows how the uncertainty region is calculated: as a swept square. The large gray squares show the pixels that will be rendered. The pink squares show pixels rendered using the "Top-Left Rule", which comes into play as the edge of the triangle crosses the edge of the pixels. There can be false positives (pixels set that should not have been) which the system will normally but not always cull. 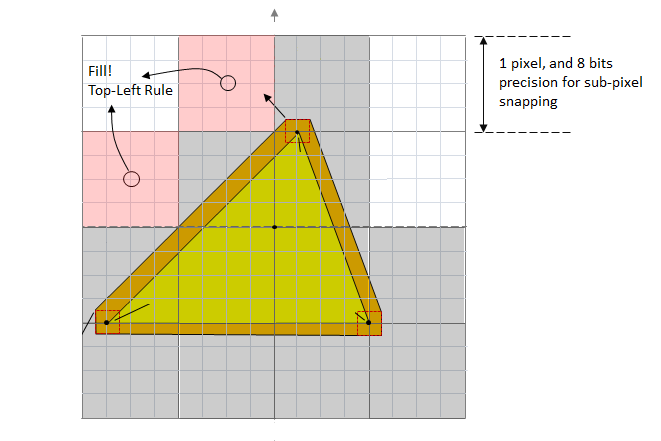 In Conservative Rasterization mode, Rasterization Rules apply the same way as when Conservative Rasterization mode is not enabled with exceptions for the Top-Left Rule, described above, and Pixel Coverage. 16.8 Fixed-Point Rasterizer precision must be used. Pixels that would not be covered if hardware was using full floating point vertex coordinates may only be included if they are within an uncertainty region no larger half a pixel in the fixed point domain. Future hardware is expected to reach the tightened uncertainty region specified in Tier 2. Note that this requirement prevents sliver triangles from extending further than necessary. A similar valid uncertainty region applies to InnerCoverage as well, but it is tighter since no implementations require a larger uncertainty region for this case. See InnerCoverage interaction for more detail. Inner and outer uncertainty regions must be greater than or equal to the size of half the sub-pixel grid, or 1/512 of a pixel, in the fixed point domain. This is the minimum valid uncertainty region. 1/512 comes from the 16.8 fixed point Rasterizer coordinate representation and the round-to-nearest rule that applies when converting floating point vertex coordinates to 16.8 fixed point coordinates. 1/512 can change if the Rasterizer precision changes. If an implementation implements this minimum uncertainty region, then they must follow the Top-Left Rule when an edge or corner of the uncertainty region falls along the edge or corner of a pixel. The clipped edges of the uncertainty region should be treated as the closest vertex, meaning that it counts as two edges: the two that join at the associated vertex. Top-Left Rule is required when the minimum uncertainty region is used because if it is not, then a Conservative Rasterization implementation would fail to rasterize pixels that could be covered when Conservative Rasterization mode is disabled. Regardless of the number of samples in RenderTarget/DepthStencil surfaces (or whether ForcedSampleCount is being used or not), all samples are covered for pixels rasterized by Conservative Rasterization. Individual sample locations are not tested for whether they fall in the primitive or not. The SampleMask Rasterizer State applies the same way as when Conservative Rasterization is not enabled for InputCoverage, but does not affect InnerCoverage (i.e. it is not AND’ed into an input declared with InnerCoverage). This is because InnerCoverage is unrelated to whether MSAA samples are masked out: 0 InnerCoverage only means that the pixel is not guaranteed to be fully covered, not that no samples will be updated. Depth/Stencil Testing proceeds for a conservatively rasterized pixel the same way as if all samples are covered when Conservative Rasterization is not enabled. Proceeding with all samples covered can cause Depth Extrapolation, which is valid and must be clamped to the viewport as specified when Conservative Rasterization is not enabled. This is similar to when pixel-frequency interpolation modes are used on a RenderTarget with sample count greater than 1, although in the case of Conservative Rasterization, it is the depth value going into the fixed function depth test that can be extrapolated. Early Depth culling behavior with Depth Extrapolation is undefined. This is because some Early Depth culling hardware cannot properly support extrapolated depth values. However, Early Depth culling behavior in the presence of Depth Extrapolation is problematic even with hardware that can support extrapolated depth values. This issue can be worked around by clamping the Pixel Shader input depth to the min and max depth values of the primitive being rasterized and writing that value to oDepth (the pixel shader output depth register). Implementations are required to disable Early Depth culling in this case, due to the oDepth write. Helper Pixel rules apply the same way as when Conservative Rasterization is not enabled. As part of this, all pixels including Helper Pixels must report InputCoverage accurately as specified in the InputCoverage interaction section. So fully non-covered pixels report 0 coverage. Output Coverage (oMask) behaves for a conservatively rasterized pixel as it does when Conservative Rasterization is not enabled with all samples covered. In Conservative Rasterization mode, this input register is populated as if all samples are covered when Conservative Rasterization is not enabled for a given conservatively rasterized pixel. That is to say, all existing interactions apply (e.g. SampleMask is applied), and the first n bits in InputCoverage from the LSB are set to 1 for a conservatively rasterized pixel, given an n sample per pixel RenderTarget and/or DepthStencil buffer is bound at the Output Merger, or an n sample ForcedSampleCount. The rest of the bits are 0. This input is available in a shader regardless of the use of Conservative Rasterization, though Conservative Rasterization changes its behavior to only show all samples covered (or none for Helper Pixels). This feature is required by, and only available in, Tier 3. The runtime will fail shader creation for shaders that use this mode when an implementation supports a Tier less than Tier 3. The Pixel Shader has a 32-bit scalar integer System Generate Value available: InnerCoverage. This is a bit-field that has bit 0 from the LSB set to 1 for a given conservatively rasterized pixel, only when that pixel is guaranteed to be entirely inside the current primitive. All other input register bits must be set to 0 when bit 0 is not set, but are undefined when bit 0 is set to 1 (essentially, this bit-field represents a Boolean value where false must be exactly 0, but true can be any odd (i.e. bit 0 set) non-zero value). This input is used for underestimated Conservative Rasterization information. It informs the Pixel Shader whether the current pixel lies completely inside the geometry. This must account for snapping error at resolutions greater than or equal to the resolution at which the current Draw is operating. There must not be false positives (setting InnerCoverage bits when the pixel is not fully covered for any snapping error at resolutions greater than or equal to the resolution at which the current Draw is operating), but false negatives are allowed. In summary, the implementation must not incorrectly identify pixels as fully covered that would not be with full floating point vertex coordinates in the Rasterizer. Pixels that would be fully covered if hardware was using full floating point vertex coordinates may only be omitted if they intersect the inner uncertainty region, which must be no larger than the size of the sub-pixel grid, or 1/256 of a pixel, in the fixed point domain. Said another way, pixels entirely within the inner boundary of the inner uncertainty region must be marked as fully covered. The inner boundary of the uncertainty region is illustrated in the diagram below by the bold black dotted line. 1/256 comes from the 16.8 fixed point Rasterizer coordinate representation, which can change if the Rasterizer precision changes. This uncertainty region is enough to account for snapping error caused by the conversion of floating point vertex coordinates to fixed point vertex coordinates in the Rasterizer. The same 1/512 minimum uncertainty region requirements defined in Rasterization Rules interaction apply here as well. The use of InnerCoverage does not affect whether a pixel is conservatively rasterized, i.e. using one of these InputCoverage modes does not affect which pixels are rasterized when Conservative Rasterization mode is enabled. Therefore, when InnerCoverage is used and the Pixel Shader is processing a pixel that is not completely covered by the geometry its value will be 0, but the Pixel Shader invocation will have samples updated. This is different from when InputCoverage is 0, meaning that no samples will be updated. This input is mutually exclusive with InputCoverage : both cannot be used. To access InnerCoverage, it must be declared as a single component out of one of the Pixel Shader input registers. The interpolation mode on the declaration must be constant (interpolation does not apply). The InnerCoverage bit-field is not affected by depth/stencil tests, nor is it ANDed with the SampleMask Rasterizer state. This input is only valid in Conservative Rasterization mode. When Conservative Rasterization is not enabled, InnerCoverage produces an undefined value. Pixel Shader invocations caused by the need for Helper Pixels, but otherwise not covered by the primitive, must have the InnerCoverage register set to 0. Attribute interpolation modes are unchanged and proceed the same way as when Conservative Rasterization is not enabled, where the viewport-scaled and fixed-point-converted vertices are used. Because all samples in a conservatively rasterized pixel are considered covered, it is valid for values to be extrapolated, similar to when pixel-frequency interpolation modes are used on a RenderTarget with sample count greater than 1. Centroid interpolation modes produce results identical to the corresponding non-centroid interpolation mode; the notion of centroid is meaningless in this scenario – where sample coverage is only either full or 0. Conservative Rasterization allows for degenerate triangles to produce Pixel Shader invocations, therefore, degenerate triangles must use the values assigned to Vertex 0 for all interpolated values. When Conservative Rasterization mode is enabled and depth clip is disabled (when the DepthClipEnable Rasterizer State is set to FALSE), there may be variances in attribute interpolation for segments of a primitive that fall outside the 0 <= z <= w range, depending on implementation: either constant values are used from a point where the primitive intersects the relevant plane (near or far), or attribute interpolation behaves as when Conservative Rasterization mode is disabled. However, the depth value behavior is the same regardless of Conservative Rasterization mode, i.e. primitives that fall outside of the depth range must still be given the value of the nearest limit of the viewport depth range. Attribute interpolation behavior inside the 0 <= z <= w range must remain unchanged. Clip Distance is valid when Conservative Rasterization mode is enabled, and behaves for a conservatively rasterized pixel as it does when Conservative Rasterization is not enabled with all samples covered. Note that Conservative Rasterization can cause extrapolation of the W vertex coordinate, which may cause W <= 0. This could cause per-pixel Clip Distance implementations to operate on a Clip Distance that has been Perspective Divided by an invalid W value. Clip Distance implementations must guard against invoking rasterization for pixels where vertex coordinate W <= 0 (e.g. due to extrapolation when in Conservative Rasterization mode). Conservative Rasterization mode is compatible with Target Independent Rasterization (TIR). TIR rules and restrictions apply, behaving for a conservatively rasterized pixel as if all samples are covered. Conservative Rasterization is not defined for line or point primitives. Therefore, Primitive Topologies that specify points or lines produce undefined behavior if they are fed to the rasterizer unit when Conservative Rasterization is enabled. The debug layer validation verifies applications do not use these Primitive Topologies. For a conservatively rasterized pixel, queries behave as they do when Conservative Rasterization is not enabled when all samples are covered. For example, for a conservatively rasterized pixel, D3D12_QUERY_TYPE_OCCLUSION and D3D12_QUERY_TYPE_PIPELINE_STATISTICS (from D3D12_QUERY_TYPE) must behave as they would when Conservative Rasterization is not enabled when all samples are covered. Pixel Shader invocations should increment for every conservatively rasterized pixel in Conservative Rasterization mode. All Cull States are valid in Conservative Rasterization mode and follow the same rules as when Conservative Rasterization is not enabled. When comparing Conservative Rasterization across resolutions to itself or without Conservative Rasterization enabled, there is the possibility that some primitives may have mismatched facedness (i.e. one back facing, the other front facing). Applications can avoid this uncertainty by using D3D12_CULL_MODE_NONE (from D3D12_CULL_MODE) and not using the IsFrontFace System Generated Value. The IsFrontFace System Generated Value is valid to use in Conservative Rasterization mode, and follows the behavior defined when Conservative Rasterization is not enabled. The only valid D3D12_FILL_MODE for Conservative Rasterization is D3D12_FILL_SOLID, any other fill mode is an invalid parameter for the Rasterizer State. This is because D3D12 functional specification specifies that wireframe fill mode should convert triangle edges to lines and follow the line rasterization rules and conservative line rasterization behavior has not been defined. The type of rasterization supported in Direct3D 12 is sometimes referred to as "Overestimated Conservative Rasterization". There is also the concept of "Underestimated Conservative Rasterization", which means that only pixels that are fully covered by a rendered primitive are rasterized. Underestimated Conservative Rasterization information is available through the pixel shader through the use of input coverage data, and only overestimated Conservative Rasterization is available as a rasterizing mode. If any part of a primitive overlaps a pixel, then that pixel is considered covered and is then rasterized. When an edge or corner of a primitive falls along the edge or corner of a pixel, the application of the "top-left rule" is implementation-specific. However, for implementations that support degenerate triangles, a degenerate triangle along an edge or corner must cover at least one pixel. Conservative Rasterization implementations can vary on different hardware, and do produce false positives, meaning that they can incorrectly decide that pixels are covered. This can occur because of implementation-specific details like primitive growing or snapping errors inherent in the fixed-point vertex coordinates used in rasterization. The reason false positives (with respect to fixed point vertex coordinates) are valid is because some amount of false positives are needed to allow an implementation to do coverage evaluation against post-snapped vertices (i.e. vertex coordinates that have been converted from floating point to the 16.8 fixed-point used in the rasterizer), but honor the coverage produced by the original floating point vertex coordinates. Conservative Rasterization implementations do not produce false negatives with respect to the floating-point vertex coordinates for non-degenerate post-snap primitives: if any part of a primitive overlaps any part of a pixel, then that pixel is rasterized. Triangles that are degenerate (duplicate indices in an index buffer or collinear in 3D), or become degenerate after fixed-point conversion (collinear vertices in the rasterizer), may or may not be culled; both are valid behaviors. 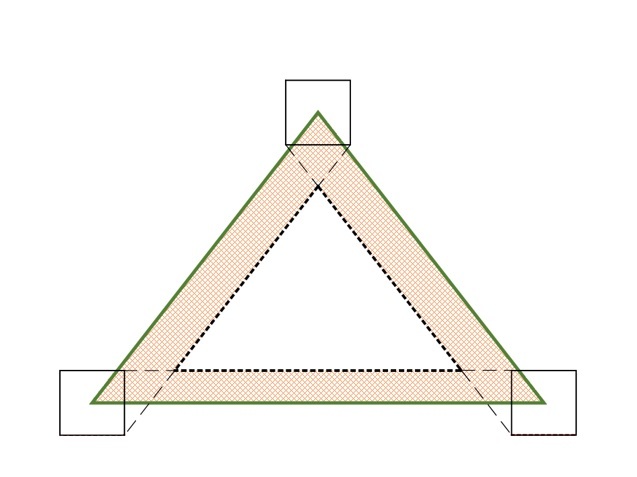 Degenerate triangles must be considered back facing, so if a specific behavior is required by an application, it can use back-face culling or test for front facing. Degenerate triangles use the values assigned to Vertex 0 for all interpolated values. There are three tiers of hardware support, in addition to the possibility that the hardware does not support this feature. Tier 1 enforces a maximum 1/2 pixel uncertainty region and does not support post-snap degenerates. This is good for tiled rendering, a texture atlas, light map generation and sub-pixel shadow maps. Tier 2 reduces the maximum uncertainty region to 1/256 and requires post-snap degenerates not be culled. This tier is helpful for CPU-based algorithm acceleration (such as voxelization). Tier 3 maintains a maximum 1/256 uncertainty region and adds support for inner input coverage. Inner input coverage adds the new value SV_InnerCoverage to High Level Shading Language (HLSL). This is a 32-bit scalar integer that can be specified on input to a pixel shader, and represents the underestimated Conservative Rasterization information (that is, whether a pixel is guaranteed-to-be-fully covered). This tier is helpful for occlusion culling. D3D12_RASTERIZER_DESC : structure holding the rasterizer description. D3D12_CONSERVATIVE_RASTERIZATION_MODE : enum values for the mode (on or off). D3D12_FEATURE_DATA_D3D12_OPTIONS : structure holding the tier of support. D3D12_CONSERVATIVE_RASTERIZATION_TIER : enum values for each tier of support by the hardware. CheckFeatureSupport : method to access the supported features. CD3DX12_RASTERIZER_DESC : helper class for creating rasterizer descriptions.